This was a slow week for mathematically-themed comic strips. Such things happen. I put together a half-dozen that see on-topic enough to talk about, but I stretched to do it. You’ll see. Mark Anderson’s Andertoons for the 6th mentions addition as one of the things you learn in an average day of elementary school. I can’t help noticing also the mention of Johnny Appleseed, who’s got a weird place in my heart as he and I share a birthday. He got to it first. 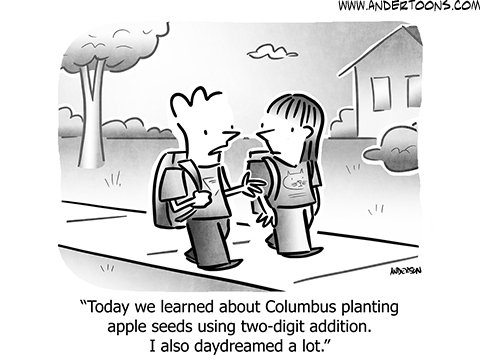 Although Johnny Appleseed — John Champan — is legendary for scattering apple seeds, that’s not what he mostly did. He would more often grow apple-tree nurseries, from which settlers could buy plants and demonstrate they were “improving” their plots. He was also committed to spreading the word of Emanuel Swedenborg’s New Church, one of those religious movements that you somehow don’t hear about. But there was this like 200-year-long stretch where a particular kind of idiosyncratic thinker was Swedenborgian, or at least influenced by that. I don’t know offhand of any important Swedenborgian mathematicians, I admit, but I’m glad to hear if someone has news. Mark Anderson’s Andertoons for the 6th of January, 2019. Andertoons often appears in these essays. You can see the proof of that Andertoons claim at this link. Justin Thompson’s MythTickle rerun for the 9th mentions “algebra” as something so dreadful that even being middle-aged is preferable. Everyone has their own tastes, yes, although it would be the same joke if it were “gym class” or something. (I suppose that’s not one word. “Dodgeball” would do, but I never remember playing it. It exists just as a legendarily feared activity, to me.) Granting, though, that I had a terrible time with the introduction to algebra class I had in middle school. Justin Thompson’s MythTickle rerun for the 9th of January, 2019. MythTickle has only barely appeared before in these essays. You can see the proof of that MythTickle claim at this link. Tom Wilson’s Ziggy for the 9th is a very early Pi Day joke, so, there’s that. There’s not much reason a take-a-number dispenser couldn’t give out π, or other non-integer numbers. What the numbers are doesn’t matter. It’s just that the dispensed numbers need to be in order. It should be helpful if there’s a clear idea how uniformly spaced the numbers are, so there’s some idea how long a wait to expect between the currently-serving number and whatever number you’ve got. But that only helps if you have a fair idea of how long an order should on average take. Tom Wilson’s Ziggy for the 9th of January, 2019. Ziggy has turned up once or twice in these essays. You can see the proof of that Ziggy claim at this link. I’ll close out last week’s comics soon. The next Reading the Comics post, like all the earlier ones, should be at this link. Last week had enough mathematically-themed comics for me to split the content. Usually I split the comics temporally, and this time I will too. What’s unusual is that somewhere along the week the URLs that GoComics pages provide switched from http to https. https is the less-openly-insecure version of the messaging protocol that sends web pages around. It’s good practice; we should be using https wherever possible. I don’t know why they switched that on, and why switch it on midweek. I suppose someone there knew what they were doing. 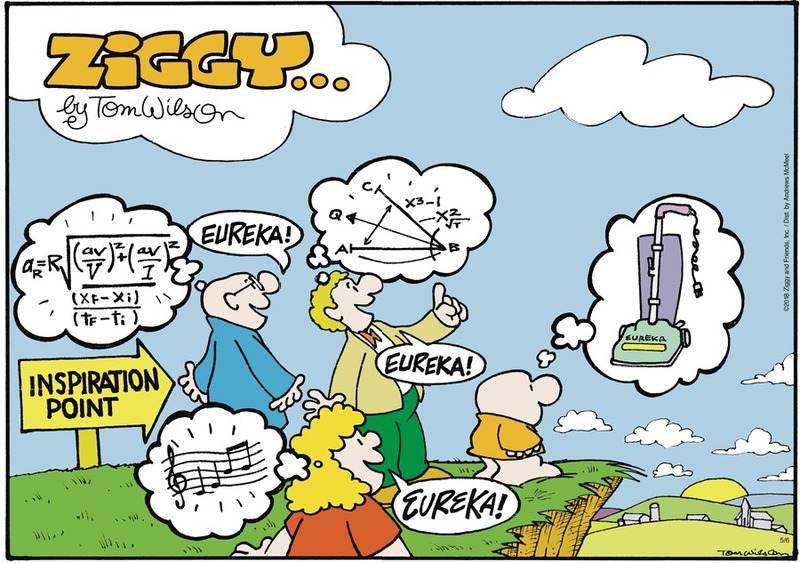 Tom Wilson’s Ziggy for the 6th of May uses mathematical breakthroughs as shorthand for inspiration. In two ways, too, one with a basically geometric figure and one with a bunch of equations. The geometric figure doesn’t seem to have any significance to me. The equations … that’s a bit harder. They’re probably nonsense. But it’s hard to look at ‘a’ and not see acceleration; the letter is often used for that. And it’s hard to look at ‘v’ and not see velocity. ‘x’ is often a position and ‘t’ is often a time. ‘xf – xi‘ looks meaningful too. It almost begs to be read as “position, final, minus position, initial”. “tf – ti” almost begs to be read as “time, final, minus time, initial”. And the difference in position divided by a difference in time suggests a velocity. Tom Wilson’s Ziggy for the 6th of May, 2018. I’m also curious whether the geometric figure means anything. But the spray of “x3 – 1” and “x2” and all don’t seem to fit a pattern to me. So here’s something peculiar inspired by looking at the units that have to follow. If ‘v’ is velocity, then it’s got units of distance over time. and would have units of distance-squared over time-squared. At least unless ‘a ‘or ‘V’ or ‘I’ are themselves measurements. But the square root of their sum then gets us back to distance over time. And then a distance-over-time divided by … well, distance-over-time suggests a pure number. Or something of whatever units ‘R’ carries with it. So this equation seems arbitrary, and of course the expression doesn’t need to make sense for the joke. But it’s odd that the most-obvious choice of meanings for v and x and t means that the symbols work out so well. At least almost: an acceleration should have units of distance-over-time-squared, and this has units of (nothing). But I may have guessed wrong in thinking ‘a’ meant acceleration here. It might be a description of how something in one direction corresponds to something in another. And that would make sense as a pure number. I wonder whether Wilson got this expression from from anything, or if any readers recognize something that I should have seen right away. Todd Clark’s Lola for the 7th of May, 2018. I’m not sure whether Monty means the 6th or the 7th of June is the last day of school, too, but either way I’m pretty sure that’s at least a week and maybe closer to two weeks before we ever got out of school. But we also never started before US Labor Day and it feels indecent when I see schools that do. Todd Clark’s Lola for the 7th jokes about being bad at mathematics. The number of days left to the end of school isn’t something that a kid should have trouble working out. However, do remember the first rule of calculating the span between two dates on the calendar: never calculate the span between two dates on the calendar. There is so much that goes wrong trying. All right, there’s a method. That method is let someone else do it. Bud Fisher’s Mutt and Jeff rerun for the 7th of May, 2018. No idea when the original was from and the word balloons have been relettered with a computer typeface. (Look at the K’s or E’s.) The copyright is given as Aedita S de Beaumont, rather than Bud Fisher or any of the unnamed assistants who actually wrote and drew the strip by this point. Beaumont had married Fisher in 1925 and while they separated after a month they never divorced, so on Fisher’s death Beaumont inherited the rights. Some strips have the signature Pierre S de Beaumont, her son and it happens founder of the Brookstone retail stores. Every bit of this seems strange but I keep looking it over and it seems like I have it right. 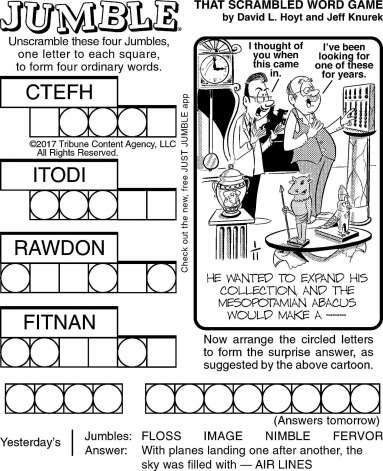 Bud Fisher’s Mutt and Jeff for the 7th uses the form of those mathematics-magic games. You know, the ones where you ask someone to pick a number, then do some operations, and then tell you the result. From that you reverse-engineer the original number. They’re amusing enough tricks even if they are all basically the same. It’s instructive to figure out how they work. Replace your original number with symbols and follow the steps then. If you just need the number itself you can replace that with ‘x’. If you need the digits of the number then you’d replace it with something like “10*a + b”, to represent the numerals “ab”. Here, yeah, Mutt’s just being arbitrarily mean. Paul Gilligan and Kory Merritt’s Poptropica rerun for the 7th of May, 2018. Sad to say the comic seems to have lapsed into perpetual rerun; I enjoyed the silly adventure and the illustration style. Paul Gilligan and Kory Merritt’s Poptropica for the 7th depicts calculating stuff as the way to act like a robot. Can’t deny; calculation is pretty much what we expect computers to do. It may hide. It may be done so abstractly it looks like we’re playing Mini Metro instead. This is a new comics tag. I’m sad to say this might be the last use of that tag. Poptropica is fun, but it doesn’t touch on mathematics much at all. Gene Mora’s Graffiti for the 8th of May, 2018. I don’t know whether this is a rerun. The copyright date is new but so much about this comic’s worldview is from 1978 at the latest. Gene Mora’s Graffiti for the 8th mentions arithmetic, albeit obliquely. It’s meant to be pasted on the doors of kindergarten teachers and who am I to spoil the fun? Scott Hilburn’s The Argyle Sweater for the 9th is the anthropomorphic-numerals joke for this week. Converting between decimals and fractions has been done since decimals got worked out in the late 16th century. There’s advantages to either representation. To my eyes the biggest advantage of fractions is they avoid hypnotizing people with the illusion of precision. 0.25 reads as more exact than 1/4. We can imagine it being 0.2500000000000000 and think we know the quantity to any desired precision. 1/4 reads (to me, anyway) as being open to the possibility we’re rounding off from 0.998 out of 4.00023. Another advantage fractions do have is flexibility. There are infinitely many ways to express the same number as a fraction. In decimals, there are at most two. If you’re trying to calculate something that would be more easily done with a denominator of 30 than of 5, you’re free to do that. Decimals can have advantages in computing, certainly, especially if you’re already set up to manipulate digits. And you can tell at a glance whether, say, 14/29th is greater or less than 154/317th. In case you ever find reason to wonder, I mean. I’m not saying either is always the right way to go. So now let me get to the other half of last week’s comics. Also, not to spoil things, but this coming week is looking pretty busy so I may have anothe split-week Reading the Comics coming up. The shocking thing this time is that the Houston Chronicle has announced it’s discontinuing its comics page. I don’t know why; I suppose because they’re fed up with people coming loyally to a daily feature. I will try finding alternate sources for the things I had still been reading there, but don’t know if I’ll make it. I’m saddened by this. Back in the 90s comics were just coming onto the Internet. The Houston Chronicle was one of a couple newspapers that knew what to do with them. It, and the Philadelphia Inquirer and the San Jose Mercury-News , had exactly what we wanted in comics: you could make a page up of all the strips you wanted to read, and read them on a single page. You could even go backwards day by day in case you missed some. The Philadelphia Inquirer was the only page that let you put the comics in the order you wanted, as opposed to alphabetical order by title. But if you were unafraid of opening up URLs you could reorder the Houston Chronicle page you built too. And those have all faded away. In the interests of whatever interest is served by web site redesigns all these papers did away with their user-buildable comics pages. The Chronicle was the last holdout, but even they abolished their pages a few years ago, with a promise for a while that they’d have a replacement comics-page scheme up soon. It never came and now, I suppose, never will. Most of the newspapers’ sites had become redundant anyway. Comics Kingdom and GoComics.com offer user-customizable comics pages, with a subscription model that makes it clear that money ought to be going to the cartoonists. I still had the Chronicle for a few holdouts, like Joe Martin’s strips or the Jumble feature. And from that inertia that attaches to long-running Internet associations. So among the other things January 2017 takes away from us, it is taking the last, faded echo of the days in the 1990s when newspapers saw comics as awesome things that could be made part of their sites. Lorie Ransom’s The Daily Drawing for the 11th is almost but not quite the anthropomorphized-numerals joke for this installment. It’s certainly the most numerical duck content I’ve got on record. Tom II Wilson’s Ziggy for the 11th is an Early Pi Day joke. Cosmically there isn’t any reason we couldn’t use π in take-a-number dispensers, after all. Their purpose is to give us some certain order in which to do things. We could use any set of numbers which can be put in order. So the counting numbers work. So do the integers. And the real numbers. But practicality comes into it. Most people have probably heard that π is a bit bigger than 3 and a fair bit smaller than 4. But pity the two people who drew and figuring out who gets to go first. Still, I won’t be surprised if some mathematics-oriented place uses a gimmick like this, albeit with numbers that couldn’t be confused. At least not confused by people who go to mathematics-oriented places. That would be for fun rather than cake. the Jumble for the 11th of January, 2017. This link’s all but sure to die the 1st of February, so, sorry about that. Mesopotamia did have the abacus, although I don’t know that the depiction is anything close to what the actual ones looked like. I’d imagine they do, at least within the limits of what will be an understandable drawing. I can’t promise that the Jumble for the 11th	is the last one I’ll ever feature here. I might find where David L Hoyt and Jeff Knurek keep a linkable reference to their strips and point to them. But just in case of the worst here’s an abacus gag for you to work on. Corey Pandolph, Phil Frank, and Joe Troise’s The Elderberries for the 12th is, I have to point out, a rerun. So if you’re trying to do the puzzle the reference to “the number of the last president” isn’t what you’re thinking of. It is an example of the conflation of intelligence with skill at arithmetic. It’s also an example the conflation of intelligence with a mastery of trivia. But I think it leans on arithmetic more. I am not sure when this strip first appeared. “The last president” might have been Bill Clinton (42) or George W Bush (43). But this means we’re taking the square root of either 33 or 34. And there’s no doing that in your head. The square root of a whole number is either a whole number — the way the square root of 36 is — or else it’s an irrational number. You can work out the square root of a non-perfect-square by hand. But it’s boring and it’s worse than just writing “ ” or “ ”. Except in figuring out if that number is larger than or smaller than five or six. It’s good for that. Dave Blazek’s Loose Parts for the 13th is the actuary joke for this installment. Actuarial studies are built on one of the great wonders of statistics: that it is possible to predict how often things will happen. They can happen to a population, as in forecasts of how many people will be in traffic accidents or fires or will lose their jobs or will move to a new city. We may have no idea to whom any of these will happen, and they may have no way of guessing, but the enormous number of people and great number of things that can combine to make a predictable state of affairs. I suppose it’s imaginable that a group could study its dynamics well enough to identify who screws up the most and most seriously. So they might be able to say what the odds are it is his fault. But I imagine in practice it’s too difficult to define screw-ups or to assign fault consistently enough to get the data needed. Zach Weinersmith’s Saturday Morning Breakfast Cereal for the 14th is another multiverse strip, echoing the Dinosaur Comics I featured here Sunday. I’ll echo my comments then. If there is a multiverse — again, there is not evidence for this — then there may be infinitely many versions of every book of the Bible. This suggests, but it does not mandate, that there should be every possible incarnation of the Bible. And a multiverse might be a spendthrift option anyway. Just allow for enough editions, and the chance that any of them will have a misprint at any word or phrase, and we can eventually get infinitely many versions of every book of the Bible. If we wait long enough.